For many of us, a two-in-one washer dryer is the perfect solution when space is limited and there’s no room for a separate washing machine and tumble dryer. Plus, having the two machines combined can help make the process of doing laundry easier and more efficient. In order to make the buying process easier, we've pulled together a round up of the best washer dryers, taking note of the capacity, energy rating, spin speed, finish and the dimensions of each machine, too, as these can all influence the performance of your appliance. For more washing machine options, browse our best washing machine buyer's guide, and read our guide to how to buy a washing machine and tumble dryer for buying advice. If you're looking to make a saving, you might want to take a look at our pick of the best washing machine deals, too. For more washing machine buying guides, as well as advice and inspiration for other household essentials, take a look at our appliances hub page. What is the best washer dryer? When it comes to choosing the best washer dryer, the AEG L8WEC166R Freestanding Washer Dryer comes highly recommended. Though it's one of the more expensive options available, its extensive selection of features make it worth the investment if you're looking for a washer dryer that really stands out from the crowd. ÖKOMix technology is one such example, which pre-mixes detergent and softener so that they are fully dissolved before they enter the drum and you can wash and dry 5kg in just four hours. With such variety available on the market, it can be difficult to know where to get started when it comes to buying a washer dryer. We'd recommend bearing the following factors in mind. Most washer dryer models will have different maximum capacities for washing and drying laundry, so you may find that you can happily wash 7kg of clothing but then you have to do two separate loads of drying, as it will only dry 4kg at once. Look at the energy rating too, as the higher it is, the lower your running costs in the long run. Most models come in a white finish but you can find black designs that have a bit more oomph style-wise. Before you buy, consider the features and functions that are important to you, as well as taking note of the capacity, energy rating, spin speed, finish and the dimensions, as these can all influence the performance of your appliance. Though this is one of the more expensive models, it’s packed with features that really make it stand out from the crowd. ÖKOMix technology pre-mixes detergent and softener so that they are fully dissolved before they enter the drum and you can wash and dry 5kg in just four hours. Users rave about the ProSense intelligent sensor drying programme, which detects moisture inside the drum and automatically finishes the cycle once your preferred level of dryness is achieved. The USP with this design is its anti-stain technology, which tackles the most stubborn culprits with ease. It also pre-mixes water and detergent before it enters the drum for deeper cleaning. Users love the choice of 16 programmes including a 30-minute quick wash, wool cycle and sports option as well as the sensor drying, which reduces the need for ironing. The great thing about this model is that it uses a spin and spray technique that delivers an intensive wash in under an hour. There’s no overloading of detergent thanks to the automatic dispensing and it also comes with a special anti-fluff programme, which prevents clothes discolouring due to fluff from other garments. In all there are 21 programmes to choose from, one of the most extensive on the market. Ultra energy efficient and quiet to run, too, this model comes with an EcoSilence Drive as well as Allergy+ and HygieneCare, a wash programme with a high dry temperature pre-treatment for hygienic fabric care. Users love the fact it takes 65 per cent less time and uses 50 per cent less energy than other washer dryers, as well as the Reload option where you can add in or take out an item of clothing whenever you need to. There’s even a DrumClean function for a spotless interior and a super-quick 15 minute wash cycle. 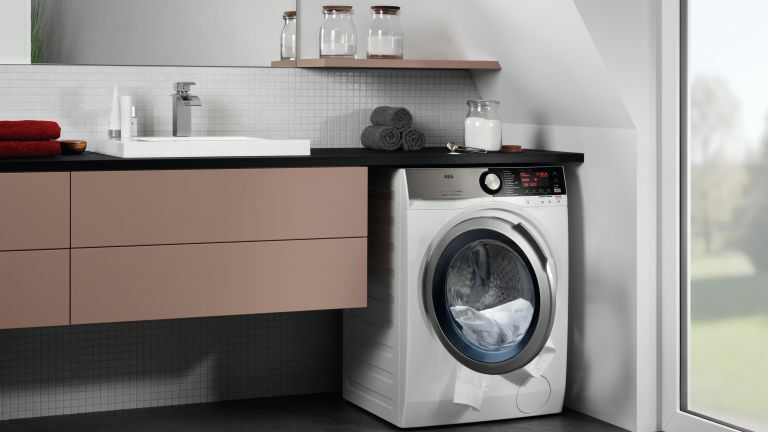 This i-Sensoric model uses sensor-controlled autoDry technology to complete your washing and drying in under an hour. It comes with textile guard re-proofing for gentle waterproofing of outdoor clothes and is ultra quiet thanks to its iQdrive motor. Siemens are so confident about the durability of its motor that it has a 10-year warranty. As well as standard programmes for cottons, delicates/silk and so on, users love the special cycles for hygiene, a 15-minute quick wash, towels, shirts/blouses and mixed fabrics. Looking for more washing and laundry advice or information?